Perhaps these days Syria seems even more important than it ever was, with ISIS in Iraq and their intentions of cutting across geographical borders to create a sectarian state for the Sunnis in both countries. The Region is so complicated, I can’t imagine what George W. Bush was thinking when he decided to step in and upset the delicate balances… But I’m not a political writer, never will be, also not a conflict journo. What I know about, where I get my info, is all about the movies. 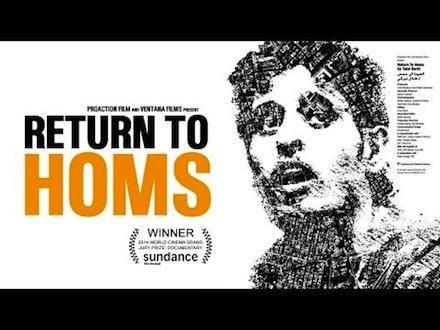 At an amazing event in Florence, the Middle East Now Film Festival, I watched Talal Derki’s Return to Homs and since then, I have not looked at a headline from Syria without a pang of sadness and deep loss. That’s why I think cinema can change the world, because it changes me, every day. Below, a few thoughts from my Huffington Post piece on the film. It’s as if we’re all watching the daily show of a developing catastrophe, one too gigantic for us to believe, and so we tune out, turn off and try to reason that it’s perhaps media propaganda… I know I felt that way, until Derki’s film set me straight. For the entire blog post, click here. This entry was posted on Friday, June 13th, 2014 at 6:11 am and is filed under Adventures, Films 2 See. « Lets Go Brazilian with Castanha!